I have heard of street performers (sometimes students) erupting into Shakespearean soliloquies in public places either as advertisement for a performance, as guerrilla art, or as an assignment. Unfortunately, youtube is lacking in the latter category. Street Shakespeare is a project that intrigues me greatly, mainly because it is so out of context and could be a lot of fun! A balcony scene in the subway! A duel in a courtyard! A witches’ brew boiling on a restaurant table! 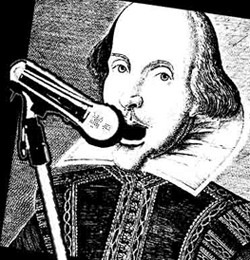 If you or your students have participated in any Spontaneous Street Shakespeare, let us know! How did it go? What are your thoughts on this kind of performance art? As we all know, Shakespeare’s work entails more than just his theatrical accomplishments; he was a published poet even as he penned his well-known plays. In times when the playhouses were closed due to contagious illness, Shakespeare was able to find a patron (Henry Wriothsley, Earl of Southampton) who paid well for his poetry, and, when published, garnered more publicity for the wordsmith. This particular poem was popular with the Elizabethan crowd. It played upon their interest in Greek mythology as well as their more private appetites. 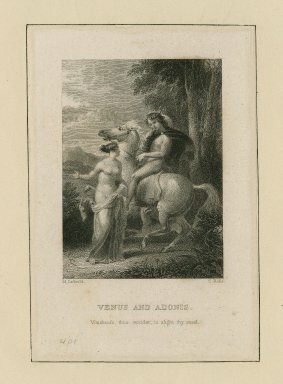 While Venus and Adonis might not be of interest in full for all classrooms, it is interesting to note certain parallels between Venus’s first arguments of love (lines 90-174) and speeches made by other Shakespearean characters. How much does that sound like Romeo attempting to steal a kiss from Juliet? [Juliet]: Ay, pilgrim, lips that they must use in prayer. Many of these stanzas could very easily be performed for an audience as a monologue from Shakespeare that few might recognize! Could you see using the narrative poem in your classroom? Have any ideas to share with us about that? I’m pretty sure I know what you’re thinking; you’re thinking: FINALLY! Finally someone has put together a medium and a creative genius that work together even better than chocolate and peanut butter. Shakespeare was always meant to be seen. His plays have a special mix of magic and kineticism. What better medium for that than the larger-than-life world of comics? And, of course, there is the Bard’s language – also a GREAT match for comics (what seven-year old but a comics reader knows the word “nemesis”?). Now, it was never our plan for Kill Shakespeare to be a teacher’s aide. We just wanted to tell a rollicking adventure that passed on our love for the Bard (developed in high-school) in a fresh new way. But after the umpteenth teacher approached us we realized that Kill Shakespeare makes a lot of sense for educators. Why not use the graphic novel as a way to introduce students to some Shakespearean tropes – love, lust, double-crossing, cross-dressing, prophesies, menacing daggers, motley fools, and more? It’s all here for students to see that Shakespeare is FAR from the “stuffy, dead guy” their older brothers and sisters have warned them about. Issue 4, Page 6* Juliet the Rebel "our voice is in our swords..."
… well sometimes we just heisted an entire line off the Bard and gave it to a completely new character. So, while we would never claim that Kill Shakespeare IS Shakespeare – the Bard’s gift for words so far exceeds our own – we do think it is a heck of a lot of fun for both devotees of “Shakey” (as we like to call him) as well as for students or adults who have only a passing familiarity with his genius. Conor McCreery is a Co-Creator of the popular graphic novel, Kill Shakespeare. Conor has served in both creative and business positions for film and television companies, contributed over 1,000 stories and articles for media outlets and also provided expert analysis for Canada’s Business News Network. *artwork by Andy B., colour by Ian Herring. Anthony Del Col and Conor McCreery will be speaking about Kill Shakespeare at the Folger on February 15 at 7:30pm. Issues #3-#8 are available for sale from the Folger Shop. The best Shakespeare production I’ve ever seen was also the worst. A friend of mine was doing a community theatre production of Titus Andronicus years ago and it was quite bad (with the exception of my friend, who may be reading this… oops!). Bad acting, directing, sets, costumes and props (a papier-mâché head that looked like it was made by the director’s son – who was in kindergarten). Yet I left the theatre inspired and dazzled. Why? Because it was at that moment that I realized how great Shakespeare’s stories were. I tried to look past – ignore, really – all of the bad elements of this production to focus on the characters – and they were remarkable. This is what we’re trying to do with Kill Shakespeare. No, not make a bad version of Shakespeare but rather create a product and story that will allow us to shine a spotlight on these fantastic characters. And we do so by putting them into a new scenario where they co-exist with the Bard’s characters from other plays. So often it’s difficult to people to get past the language and other surfaces of Shakespeare’s plays. We’re using a combination of modern-day and Elizabethan English to eliminate that barrier get people into our characters quicker. Yes, some scholars have objected to this strategy but many have loved it. The best reviews we have received are those that state that reading our series has made them pick up their Shakespeare texts for the first time in decades. Why? Because they realize how funny actually Falstaff is, how stubborn Juliet is, and how convincing and determined Iago and Lady Macbeth can be. These are some of the greatest characters ever created, and we relish the opportunity to present them in a new, exciting and stimulating way. Now I wonder if there will be a community theatre production of Kill Shakespeare one day…? Anthony Del Col is a Co-Creator of the popular graphic novel Kill Shakespeare. Anthony has worked in the music, film and television industries, produced two independent feature films and most recently assisted with the management of international pop star Nelly Furtado and her world tour. Is It Harder To Act Shakespeare? Folger Theatre presented the first of its four matinee performances of The Comedy of Errors for students today. As we have in the past, students were invited to participate in a talk-back with the actors following the performance. One of the students asked the cast whether or not it was harder to act Shakespeare than contemporary plays. A great question. Members of the cast gave terrific answers. It is harder to act Shakespeare. The language can be more challenging, requiring more effort to get the message in the text across to an audience. But, noted one cast member, eventhough the work was written more than 400 years ago, what it says about the human spirit has remained constant. When an actor knows the intent of a line, it is easier for an audience to understand. So, the actors’ advice to the students was to “do their homework,” make sure they understand what they are saying and use their voices and their bodies to get the intent across. So, is it harder to act Shakespeare? Is there a difference between performing Shakespeare’s plays and another playwright’s? What do you think? The truth is, as I am sure everyone knows reading this blog, studying Shakespeare is FUN and he is for EVERYONE. Just as Ferdinand was able to convince Biron to sign the oath to work at the academe, it is my hope that educators will realize that even the youngest student can grasp Shakespeare’s themes. 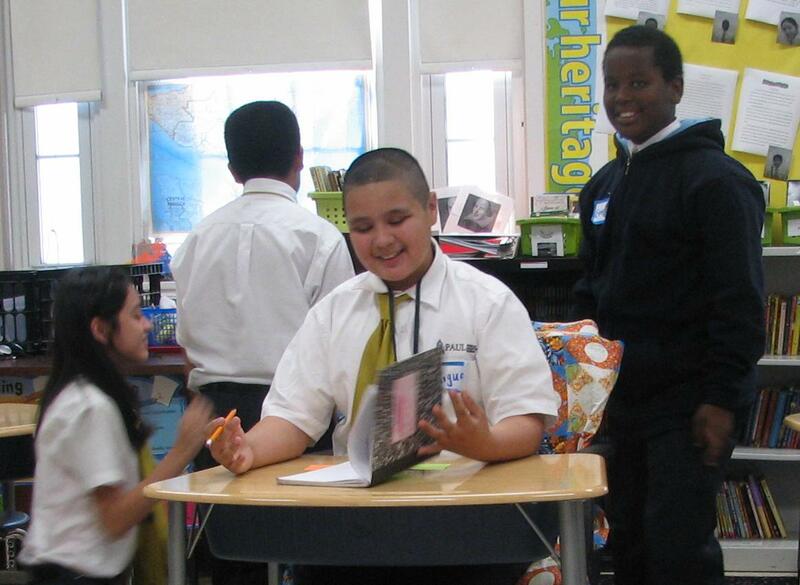 Students from Paul PCS determine what “prabble” means by acting out the sounds. When I switched from teaching high school English in Chicago to 6th grade ESOL in DC, I wondered if there was a place for Shakespeare in my classroom. With mounting pressure for my students to pass the DCCAS state assessment and with my students’ varying English proficiencies I almost reasoned against teaching Shakespeare. For about 5 seconds. No matter what I cannot bring myself to take the joy factor out of education. With a little bit of planning and creativity I found a way to weave core learning standards, the balanced literacy approach I use in my instruction, and our good friend Will. The resources here: “Strategies to push students from struggling to independent readers” are far less exciting, but nevertheless, they provide infallible pre, during, and post reading strategies to engage students in reading Shakespeare while building their capacity to attack even the most difficult passages.